An innovative machine showcased in the 1906 American Elimination Trial was the unique, air-cooled Frayer-Miller entry with designer Lee Frayer at the wheel. The only car to place the driver on the left side, this entry (one of three Frayer-Millers entered in the American Elimination Trial) broke a radius rod on the first lap and finished last. 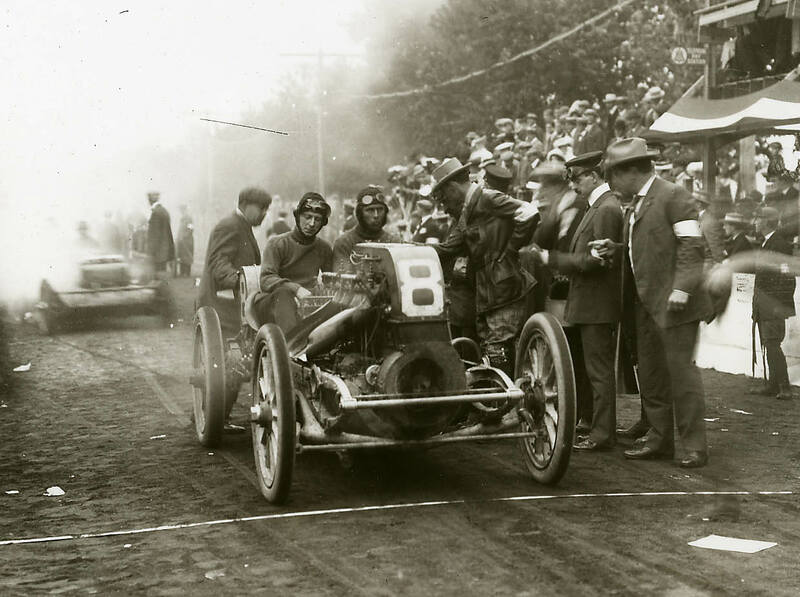 Frayer’s riding mechanician for the 1906 American Elimination Race was 16-year-old Eddie Rickenbacker (left). He was arguably the most significant historical figure present that day. Rickenbacker later drove in both the 1915 and the 1916 Vanderbilt Cup Races and five Indianapolis 500 Races. Eddie's greatest moments came from his career in aviation, where he became America’s World War I flying ace and, later in life, rose to President and General Manager of Eastern Airlines. Rickenbacker's incredible life was reviewed in an earlier VanderbiltCupRaces.com post. One of the three Frayer-Miller cars did qualify for the 1906 Vanderbilt Cup Race and can be seen at the very beginning of the 1906 film. More information on the Frayer-Miller cars can be found on this blog by Scott Noteboom, Lee-Frayer's great-great-grandson. Comments, feedback and contributions are much appreciated. Please leave your comments at the end of a post on the Blog or send me an email at Howard@Kroplick.com . An automobile innovator, designer of one of the first air-cooled engines, and driver in the 1906 American Elimination Trial and the 1911 Indy 500 Race.